You know it's a slow news week when the tabloids put out the requisite "Are they too thin?" cover. 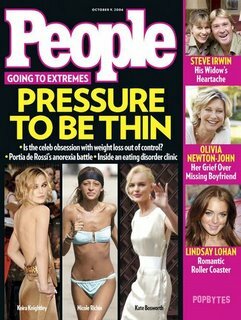 How many times are they going to interview Portia De Rossi about having anorexia? Are they too thin? Of course they are, retards. Is putting them on a magazine cover going to encourage them to eat a burger? Uh no, it's going to fuel cigarette sales and get them into Area ths weekend. I agree, covers with too thing celebrities will hardly make them eat a burger. But maybe, teens who want so much to look like celebrities will see these awful pictures and will break their fasting. Maybe, teens will see that being very thing doesn’t mean to look really beautiful.